Words Done Write: Is Out-of-State Commuting for You? Is Out-of-State Commuting for You? Job searching, but can’t find a job in your city? Your state? No problem! Location makes no difference if you’re someone who is flexible--and adventurous--enough to spend hours on planes and in cabs each week to travel to an out-of-state job. Interstate commuting is par for the course for Kari Ryerson. For the last nine years, Kari has been a well-respected and sought-after electronic medical records consultant. She works with hospitals to move them from paper records to electronic ones, transition them from one record system to another, or optimize the system they have in place. When I first met Kari, she lived in L.A.. However, that soon changed. She and her husband bought a new home in Las Vegas, but she kept her job at UCLA in Los Angeles. That meant weekly plane rides to California, where she’d work the week and fly home on weekends. That was just the beginning, though. 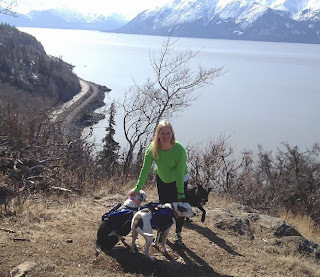 In time, Kari and her husband relocated from Vegas to Anchorage, Alaska. Yet (get ready to gasp! ), Kari still had her job in L.A.. That meant a weekly commute from Alaska to Los Angeles! (and their canine friend) on a hike in Alaska. But, this year, Kari took on a new client in Indianapolis, Indiana. And, again, she is commuting from Alaska. With such a long commute time, Kari spends most of her off-hours in transit, trying to get home to spend as much time with her husband and four rescue dogs as possible. Kari’s lifestyle has always intrigued me. I hate long commutes, so Kari’s weekly schedule just makes my head spin. However, at the moment, it works for her and her family. I caught up with Kari as she sat in an airport on a long layover after her flight was cancelled. Her story fascinates me and I hope it does you, too. Q: How many air miles do you log each week/month/or year? A: Week: 6,300. Month: 26,000. Year: 300,000. Q: How many days of each week do you work, travel, and enjoy time at home? A: I fly out on a Sunday red-eye and return home on Thursday night. I sleep in my bed three nights, in a hotel three nights, and on a plane one night. Q: What is your travel routine? A: I’m all about the perks. I use the same airline, hotel, and rental car company so that I earn points and get upgrades. I try and fly direct, but currently I have a layover in Chicago. It’s great on Monday mornings because the United Club has showers. I am able to use my layover time to refresh, wake up, and make myself presentable. I have another layover in Chicago on my way home. I tend to make this one a bit longer because the short flights get delayed and cancelled often so I am weary of booking too short a connection on the way home. I take a cab to and from the airport. It’s faster than driving and parking. Q: How do you afford the travel costs associated with an out of state job? A: Travel costs are covered as part of my contract, I get them all reimbursed. Q: What is the toll of being on the road so much? A: You can never participate in activities that happen on Monday through Thursday nights. No sports leagues/classes etc. You also miss your family a lot. Q: Are you frequently jetlagged? A: I’ve decided that my body lives on Mountain Time, exactly half way between the time zone I live in and the time zone I work in. Q: Why does this unusual work arrangement work for you? A: It’s what I have been doing since I left college other than a few years in which I worked in hospitals where I lived. Q: Would you recommend out of state commutes for others? A: Not unless you really know what you are getting into. I am weary of first timers because a lot of them decide they hate life on the road and quit projects part way through. Q: How do you choose which out of state contracts to pursue? A: It depends on the hospital, project, and who is already working there. It’s rare for me to work on a project and not know a single person already, they tell me a lot about what it’s really like so I can judge if it will be a good fit or not. Q: Is this a routine you intend to keep up throughout your career? A: I hope not, but I have been saying that since I started. Q: What does your family think of the long commutes that you endure? A: They are used to it. I have always been nomadic (I spent a year of high school abroad as an exchange student). For my husband and me it’s normal. Even when I did live and work in the same city, he worked nights (other than a short period of time) so we only had weekends together. Q: Do people think it's crazy that you commute to the Midwest from Alaska each week? A: Absolutely, more so that I commute to a place on Eastern time so it’s a 4-hour time change each way. Q: What are some of the biggest challenges of commuting out of state? A: The biggest downside is that vacations become not as great. Every week I get on a plane, stay in a hotel, and rent a car. When I have time off I don't want to get on a plane, stay in a hotel, and rent a car. I want to stay home. That’s the hardest part of a relationship, my husband is home all the time and wants to go places. I am away all the time and want to be a homebody when I get the chance. I think it’s safe to say that most of us don’t have the stomach to do what Kari does each week, but her story is a great reminder that we shouldn’t be limited by geography. Opportunity may not be right in our backyard, but who’s to say we can’t hop a plane to visit opportunity in another state? To learn more about Kari, and the exploits of her family and rescue dogs (including book reviews of the many books she reads while waiting in airports! ), be sure to check out her blog, Dog is God in Reverse. I think I'd just be tired all the time, P.J.! It's funny, living in NYC, commuting within the tri-state area of NJ and CT is really not even considered traveling from state to state by most commuters. I know some folks who even commute from PA and this is considered a long-distance commute. I had a friend who told me she used to commute from NYC to DC and I was like "What? No way!" If I didn't have a husband and my 3-Pack I would have no problem with long distance commuting, but honestly I wouldn't choose it. I have, however considered it when I was out of work. I actually was going after a job in Miami (didn't know it until I got the call because they advertised for someone in NY) and while they were looking for someone to relocate to Miami, in my head, it was going to be a commuter job with the consideration of moving there permanently. With RentalCars you can get affordable car hire from over 49,000 locations across the globe.